I watched the historic Game 3 of the 2018 World Series from the first row of the Auxiliary Press Box on the Reserved level at Dodger Stadium, two levels up from the Main Press Box in which I was sitting 30 years ago when Kirk Gibson produced the impossible in an improbable year and about on the same level on which I was sitting 55 years before when I attended/covered my first Dodger Stadium World Series, the Dodgers improbable sweep of the New York Yankees. –Dodger starter Walker Buehler woke up some Dodger Stadium echoes in his dominating 108 pitch starting stint, his final pitch a 98 mph fastball. At 24, armed with a high 90s fastball, mid 90s cutter and mid 80s knuckle curve, he continued to remove any doubt that he is the new ace, whether Clayton Kershaw opts out or stays. It is even hard to remember that it was only a couple years ago that it wasn’t clear how Buehler would respond to Tommy John surgery. Another victory for the procedure. –Nathan Eovaldi, who pitched in relief in Games 1 and 2, and who was scheduled to start Saturday’s Game 4, was absolutely heroic in his 97 pitch relief effort that ended with Max Muncy’s walkoff game winner. With only Chris Sale and Drew Pomeranz remaining among Boston’s 11 pitchers, Manager Alex Cora made up his mind that Eovaldi would be the altar on which he would win or lose, and as the pitches and minutes clicked by, Eovaldi kept responding, tirelessly delivering high 90s heat and several pitches at 101. When it was over, after Muncy’s opposite field, dagger, several Boston teammates said they were brought to tears by Eovaldi’s dogged effort. –I wrote the word “symptomatic” in my notebook as I watched the hitters walk away holding their bats, the innings crawl by, and the blue towel waving crowd slowly begin to thin out. In the end, there 34 were strikeouts and only 18 hits, and that’s just the way it is in this new Swing Era when launch angle and exit velocity are the dominating themes. –Boston second baseman Ian Kinsler was involved in two, head shaking plays given his veteran’s experience. In the 13th inning, with Muncy on second, two outs, and Boston the one out away from a 2-1 victory, Yasiel Puig hit a soft grounder up the middle. Kinsler fielded it near the bag but made what appeared to be a very hurried throw to first despite having time, a throw he has relaxed and made hundreds of times. The ball sailed beyond Mitch Moreland’s reach, and Muncy scored the tying run. In the 10th inning, representing the winning run, with one out, Kinsler was sent on Edwin Nunez’s fly ball to Cody Bellanger in mid center. No problem with the decision, but Kinsler chose not to slide on Bellanger’s perfect throw to Austin Barnes. Kinsler appeared to have a clear view of Barnes with the ball but went in stumbling at the catcher instead of sliding toward the outside part of the plate. Of course, there was no on-deck batter up close signaling him in which direction to go and whether to stay up or down. Inning over, still tied, costly mistake. —Manny Machado will soon head into free agency in pursuit of a $300 million or so contract. Whether he has diminished his value during his time with the Dodgers may or may not play into his bargaining power, but I suspect the Dodgers can’t wait to say “good riddance.” Machado went 1 for 7 in Game 3, and on his only hit added to a litany of questionably dirty slides and plays, and less than 100% effort. Machado lined a drive off the top of the left field fence and, obviously thinking it was going to be a home run, trotted toward first base. The ball caromed back to left fielder J.D. Martinez, and Machado was held to a bad taste single. 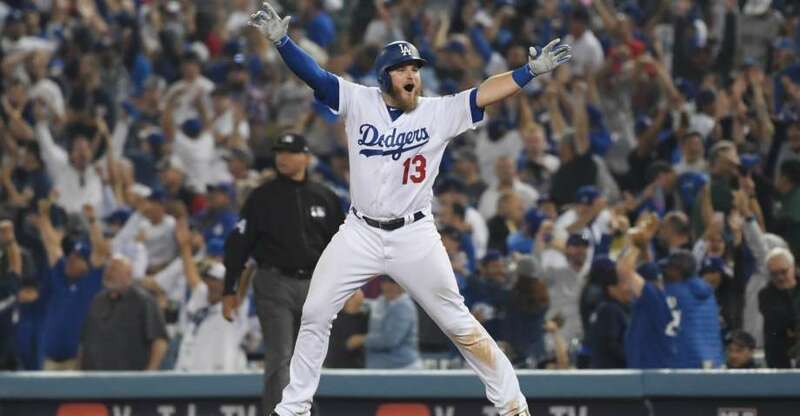 –If this was a game the Dodgers had to win, having lost the first two games and no team having ever come back from 0-3, it was impossible to come away from this aptly headlined “L.A. Marathon”, without thinking it was the Red Sox who had absorbed the body blow and it might be difficult coming back given their thinned pitching and problems coping with the absence of a DH in the NL park. For Game 3 Cora put productive left fielder Andrew Benintendi on the bench (he would strike out as a pinch hitter) and put DH J.D. Martinez in left, prompting Cora, during the course of the game, to move Martinez to right and put superior defender Mookie Betts in left depending on whether the Dodgers hitter batted left handed or right handed. He made the move several times. Ultimately, the Red Sox played the last few innings without the power of Martinez (replaced for a pinch runner) and Steve Pearce (limited to having pinch hit), besides Benintendi. –I left Corona at noon accompanied by middle linebackers Kenny Torres and Mike Wheaton and returned after 2 a.m. wondering what had happened in all those Boston bars when, three hours later, the game rolled on and it was long past last call and the TVs were turned off amid the probable uproar. Well, hell, at Dodger Stadium the game had rolled on long past the beer taps being shut down and the concessions shuttered.